The First reading last Sunday, the 21st Sunday of Ordinary Time, told of the extraordinary promise of the people to serve the Lord, grateful for his love and care for them. There is pride, joy, thanksgiving in the voice of the people, as they respond to Joshua’s challenge. The tragedy is that the voice gestures towards a wholeness of relationship that Israel cannot live up to. The wonder is that – despite the failure of the people to continue to honour their relationship with God in all circumstances. – God remains faithful to them in all circumstances. That same love, that same faithfulness is available to us, always, everywhere. And faced by such wonders we too face the same choice – to follow the Lord, or not. To enter into newness, trusting in theresence and support of the One God, or not. It sounds like a no-brainer. The scriptures remind that it is not. If we are to follow, we have to choose. When has the absolute gratuity of God’s love made a difference to your life? How might it make a difference now? 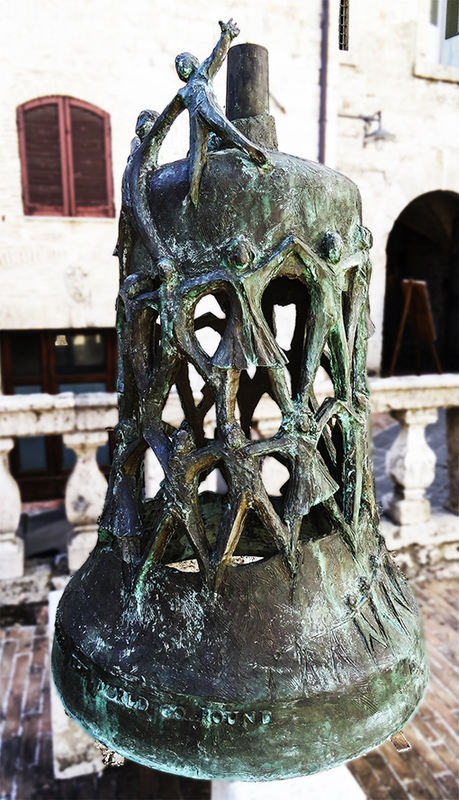 Photograph of Bell of rejoicing in Assisi. (c) 2014, Allen Morris.